Radical Heights has made a strangely large splash since its release into “X-treme early access” last week, a launch so early that developers Boss Key Productions had not yet managed to add female character models to their game. Thankfully, it seems they’re soon to fix that glaring oversight, as studio head Cliff Bleszinski tweeted an image of the models yesterday. 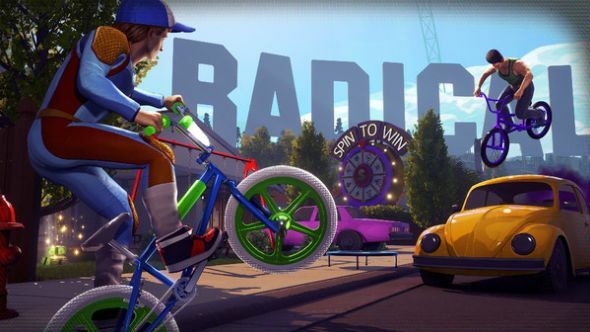 Radical Heights needs to be the wildest game show it can be – or die trying. The image shows five character models, all of which are somehow even more garishly 80s than their mullet-ridden male counterparts. I say models in the plural, but that’s not really true – Boss Key have developed five different-coloured insanely neon jumpsuits – complete with leg-warmers, headbands, and, of course, pistol – but the Barbie-style character behind each of them is the same.